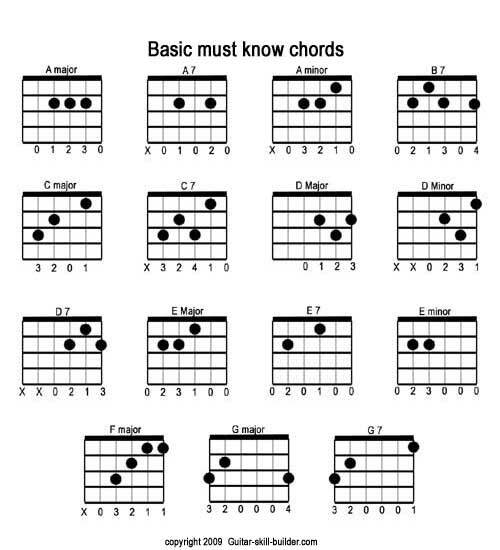 Chord charts are diagrams like these that teach you chords or scales by telling you where to put your fingers on a guitar fretboard. How cool would it be if you could do the same thing on an actual guitar? Well maybe not an actual guitar but a 3D printed one? Well, let's get started! The 3D model was created using Autodesk Inventor. I used this CAD model from grabcad.com and modified it for my project. The base box actually came with the Arduino kit that I bought but you can print the box as well. I have provided the Inventor files, including the base CAD, for everyone. Ignore the dial on the picture. I wanted to add a servo but since the matrix and the servo both use interrupts, I couldn't get them to work together. Print the 3D models. I printed the guitar in 3 parts. The picture above actually has the headstock and the neck back pieces glued together. I used epoxy glue for much of the gluing purposes. I also used super glue to fill in pieces that seemed to be coming apart. You want to sauter and connect the LEDs as per the LED matrix picture. This is called multiplexing whereby, all the cathodes and anodes of each row and column are connected. I connected all the cathodes of one row by sautering them together and then connected all the anodes of a column with magnet wire. I then connected the six column wires (each connecting all the anodes of one column) to six cables (red in the picture) and five row wires (each connected to the sautered cathode connection) to five cables (blue in the picture). I secured them using heat shrink. This method reduces the number of wires, and, as a result the number of Arduino pins needed, to 11 (6+5). I have provided the breadboard connections as well. The Arduino sketch has been uploaded. Due to it being very long and containing a lot of tabs, I did not put it all here. But the code has been commented to help anybody out. Assemble all the pieces. If you want to, you can make a cut out for the Arduino ports but I used a portable battery charger to power the Arduino with the sketch already saved in the memory. No Video of it working? Hey!! Very cool project!! I would love to build one of my own! Can you please answer a few questions for me? -What materials are the top guitar fret and base box made out of? I don't know if I'll have access to a 3D printing machine so do you know of any other way to get these two parts? -Does the LCD display the name/type of chord when that chord is displayed? Great idea. Can you include the STL files? I'd like to print this. What a cool idea! And, it looks great! brilliant! love this! well done! Thank you. I'll check that out! Great learning tool! That looks awesome. From the first picture I couldn't tell it was 3D printed, that's a nice model. Thank you very much. The model was actually taken from grabcad. Not my credit.